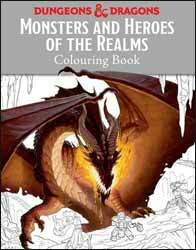 Dungeons & Dragons: Monsters and Heroes of the Realms Colouring Book is a 98-page colouring book from Studio Press Books. It's an official Wizards of the Coast release, which means they've given it their blessing. There's a nice mix of illustrations from the very simple, to the more intricate and this can equally be used as a book to practice your painting skills or dig out the crayons / felt tips / ink. There are also a handful of dungeon map plans, which give a basic outline so that D&D fans can design their own dungeon. Personally, i'd scan the images in to a computer and then print them off - you could probably get away with taking a photo on your iPad/Android device and printing that off too. There's a section near the centre of the book, where each of the illustrations is represented again in miniature along with the original title and artist. This wastes several pages, but some may find it challenging to try and colour in the miniature pictures and others will relish the information on the artist in case they want to do some research and search out their body of work. We then get another section which shows some of the paintings fully finished by the artists, which may inspire you to use the same colour scheme or have a go at painting or inking yourself. Only about two thirds of the book features full page images to colour in yourself, but the additional content make for an interesting read.